Destiny Skaggs is having a couple of graduations this summer. 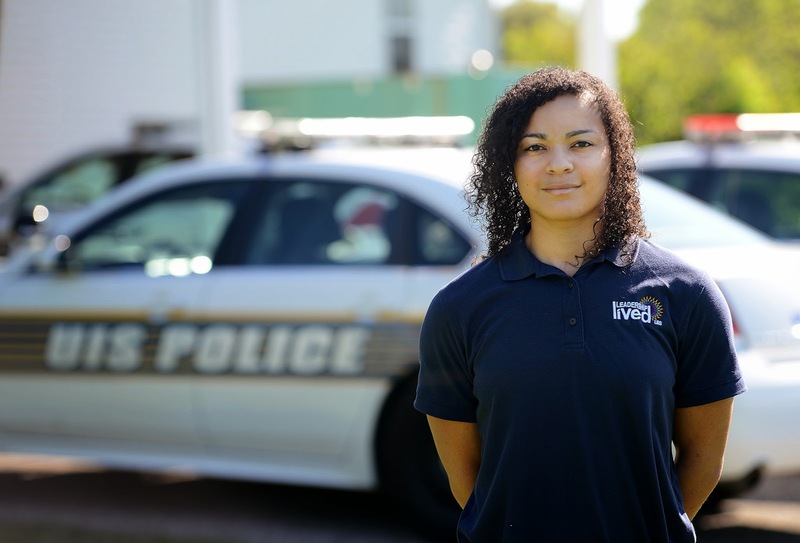 She participated in the University of Illinois Springfield commencement exercises May 17, where she received her degree in criminal justice, and then will graduate from the Illinois State Police Training Academy in September as likely the first black woman to be hired for the UIS Campus Police force. Skaggs, 26, shared the graduation stage earlier this month with her sister, Natalia, who got her degree in social work. They are the first members of their family to graduate from college. That family connection is important to Skaggs, who was born in Plano, Texas, but moved to Edinburg in time for the sixth grade. She applied for a position on the campus police force because it was one of the first law enforcement jobs she heard about. She got the letter offering her the campus police job on her birthday. Skaggs got an associate degree from Lincoln Land Community College before completing her bachelor's degree at UIS. Skaggs was featured by The State Journal-Register on May 28, 2014. “Talented” isn’t quite the word to describe Charles Schweighauser. The highly accomplished local scientist has been retired since 2002, but the 78-year-old has a long list of career credits that continues to grow. He began his career in 1963 as the founding director of the James S. McDonnell Planetarium in St. Louis. He joined the faculty of Sangamon State University (now University of Illinois Springfield) in 1974, when the school operated out of temporary buildings. He started his free-to-the-public Star Parties in 1977 and is proud of his efforts to make the parties accessible to people with disabilities. He retired with the title professor emeritus of English and astronomy and physics at UIS and has published works on James Joyce and Ralph Waldo Emerson. After retirement, he taught for seven years, directed observatories and conducted research, he said. “I remember looking through the telescopes as a young boy at Charlie’s Star Parties and wondering about our moon, solar system and Milky Way Galaxy,” said AJ Wacaser, a UIS student who had Schweighauser as his graduate adviser. Not only has Schweighauser inspired generations as an instructor and at his public presentations at UIS, he is also inspiring to all ages as an environmentalist. At his quarter-acre home in Pleasant Plains, Schweighauser has installed a dry lake with two dry rivers, a prairie path and an orchard. Schweighauser was featured by The State Journal-Register on May 25, 2014. More than 80 percent of business owners surveyed on the long-term outlook for the Sangamon County economy said the ideal minimum wage in Illinois is somewhere above the $8.25 an hour required under state law. But 77 percent said they worry that a required increase will hurt their bottom lines. The report cited U.S. Bureau of Labor Statistics data that show 10 percent of Sangamon County workers earn less than $9.01 an hour. The seemingly conflicting responses from 201 businesses and not-for-profits in the survey released Wednesday reflect a desire to pay more and a traditional wariness of state mandates, said Ashley Kirzinger, director of the University of Illinois Springfield Survey Research Office. UIS conducts spring and fall surveys in cooperation with The Greater Springfield Chamber of Commerce. Kirzinger said the survey found the majority believed an increase in the minimum wage would hurt other small businesses and organizations more than their own. The story was published by The State Journal-Register on May 22, 2014. University of Illinois Springfield volleyball coach Noelle Rooke has signed 6-foot outside hitter/right side hitter Courtney Schutt, 6-1 right side/middle blocker Heather Smack and 5-7 outside hitter/defensive specialist Ally Vicsik. Schutt logged 528 kills, 150 aces and over 400 digs for Waterloo Gibault High School. She helped the team place fourth in 2012 at the Class 1A state tournament. She is a member of the Southwest Illinois Crush club team. Smack, a graduate of Eureka High School near St. Louis, dealt with injuries for a large part of her two-year career at Iowa Western Community College. She recorded 56 kills and 35 blocks in 58 sets. Vicsik is from Elkart, Indiana, and was the most valuable player on her team at Jimtown High School for three seasons. She received all-conference first team honors as a senior and appeared on the honorable mention list as a junior. The team was featured by The State Journal-Register on May 22, 2014. The first induction class into the University of Illinois Springfield Athletics Hall of Fame includes a former men’s soccer coach, a former men’s soccer player, a former women’s tennis player, a major contributor to the program and the school’s first national championship team. Named to the inaugural induction class were Aydin Gonulsen, athletic director and soccer coach (1976-2002); Harold Christofilakos, Friend of the Prairie Stars; Carla (Jimenez) Mills, tennis (1998-2000); Elias Shehadi, soccer (1976-1979); and the 1986 NAIA national champion men’s soccer team. “This is a great opportunity to celebrate and honor key individuals who have made tremendous contributions to the athletics program and university,” UIS Director of Athletics Kim Pate said in a statement released by the school. The first class is set to be inducted on Oct. 11 during Homecoming with the time and place to be determined. An advisory committee of Springfield community members, UIS alumni, staff, faculty, athletic coaches and players were involved in selecting the inductees. The story was reported by The State Journal-Register on May 20, 2014. More than 1,360 UIS students were eligible to participate in Saturday’s ceremony. Chancellor Susan Koch said the university and its students are deeply engaged in the community. “All of our students, regardless of majors, have wonderful opportunities to volunteer and contribute to the community. It’s really a hallmark of the education here,” Koch said. Aaron Mulvey, 22, a 2010 Rochester High School graduate, was deeply immersed in the campus community during his four years at the university. This past year, he served as president of the Student Government Association, which tackled a variety if issues. Mulvey was graduating with a bachelor’s degree in communication and political science. He said there were a lot of opportunities for students at UIS, both in and out of the classroom. Commencement was featured by The State Journal-Register on May 18, 2014. A University of Illinois Springfield grad-to-be in need of a home, a whole bunch of student volunteers and a local nonprofit agency all combined for a bit of serendipity this spring. What else could you call it when UIS volunteers worked for a week on a Habitat for Humanity home that it turns out is earmarked for a fellow student who also is a foster parent? More than 175 student volunteers worked in shifts April 14-18 on the Habitat for Humanity of Sangamon County home at 727 N. Seventh St. in the Enos Park neighborhood. YouthBuild was part of UIS Springfest activities. When the house is completed near the end of July, it will be the home of Barbara Bell and her foster children. The story was reported by The State Journal-Register on May 18, 2014. It's that time of year for pomp and circumstance and diplomas. More than 1,300 students at the University of Illinois Springfield (UIS) will be college graduates Saturday. But at least one didn't think graduating from college was a realistic dream. "It's going to be amazing," said 26-year-old UIS student Destiny Skaggs. "I'll probably be all smiles up there." Destiny is one of 732 who will be walking across the stage at the Prairie Capital Convention Center and receiving a diploma--finally earning her college degree after years of hard work. "Just last semester, I worked 60 hours, I worked two jobs and then I had five classes to take care of," said Skaggs. "It's a lot of work and I wanted to do well with my grades." Making the grades is exactly what she did. "My lowest grade since 2009 was an A-," said Skaggs. She's the first to earn a bachelors degree in her family, and now graduating with honors in the criminal justice program at UIS. Like many soon-to-be graduates, Skaggs was set on landing a job, so she applied to the university's police force. The story was reported by WICS-TV 20 on May 16, 2014. The following is a portion of a column written by UIS Chancellor Susan J. Koch. It was published in a May 11, 2014 edition of The State Journal-Register. "Today marks just a few days from the end of the university semester, and by last count, 1,364 students are slated to complete their college degrees this spring at University of Illinois Springfield. The university will celebrate this milestone on Saturday in Springfield’s Prairie Capital Convention Center when several thousand graduates, faculty, staff, family members, dignitaries and friends will convene for our 43rd Commencement. Commencement at any university is always a very special day and, as chancellor of UIS, I’m proud of every participant. But as I shake the hand of each graduate, I’ll be aware that the path to graduation for some students has been much steeper than for others. I spoke to a few students last week who have made that steep climb most successfully." Rochester High School outfielder and left-handed pitcher Blake Thompson committed to the University of Illinois Springfield baseball program before it produced its first winning season and made its inaugural Great Lakes Valley Conference Tournament appearance. “(Recruiting coordinator Jordan Banfield) told me right off the bat it’s going to be one of the upcoming programs,” Thompson said. “He told me straight up, ‘We’re going to take the Midwest over, so you can either come along for the ride and be a major factor at UIS or you can commit somewhere else and look back kicking yourself. The Prairie Stars’ success, including a 28-24 final record, validates Thompson’s choice. Thompson is one of the top hitters in the Central State Eight Conference. At the plate, he leads Rochester with a .424 batting average. On the mound, he has a 1.50 earned run average. Thompson chose UIS in January after receiving offers from NCAA Division II and III and junior college programs. He is one of seven players who recently signed with the Stars. Thompson was featured by The State Journal-Register on May 10, 2014. At the University of Illinois-Springfield, J.J. Cravatta feels he'll be a big part of new head coach Bill Walker's plans. And that makes all the difference for the local star. After announcing over the weekend his plans to join the UIS Prairie Stars basketball program, Cravatta said Monday that the hiring of Walker — who comes to UIS with over 25 years of college coaching experience, most recently at Division I Drake University — and Walker's plans for the Streator standout weighed heavily in his decision to transfer downstate from Division I Northern Illinois University. "A couple weeks ago when (Walker) took the job, he gave me a call and I really like what he had to say," Cravatta told The Times on Monday. "So we kept in contact quite a bit these last couple weeks, and I finally got a chance to meet him face to face and watch him workout a couple of his guys. "We sat down, he told me everything he was planning on doing, and I really like what I heard. There was a full ride (scholarship) on the table, so I took it." The story was published in the Ottawa Times on May 6, 2014. A split with Saint Joseph’s in a Great Lakes Valley Conference doubleheader Sunday earned the University of Illinois Springfield a bid to the conference tournament for the first time in the four-year history of the UIS program. The Prairie Stars scored a wild-card berth after Saint Joseph’s won the opener 3-2, then UIS held on for a 5-4 victory in the second game. The Pumas scored twice in the bottom of the ninth inning of the nightcap. Lance LeBaron stole two bases and was 3-for-4 for the Stars. In the first game, Jared Massengill hit a RBI single in the seventh inning. Luke Stewart scored and made it 3-2. Massengill was 4-for-4. UIS pitcher James Range struck out six and walked two in five innings. UIS (28-22, 18-18) finished fourth in the GLVC East Division. The win was featured by The State Journal-Register on May 4, 2014. Popular comedian and actor Bill Cosby will perform Oct. 5 at Sangamon Auditorium at the University of Illinois Springfield. Tickets go on sale at 10 a.m. May 9. The nine-time Grammy Award winner is on his “Far From Finished” tour. A recording of his recent television special went to No. 1 earlier this year on the Billboard comedy albums chart. Tickets cost $39.50, $49.50, $59.50 and $69.50. Tickets will be available starting May 9 at www.sangamonauditorium.org, or from 10 a.m. to 5 p.m. weekdays at 206-6160, or at the auditorium box office. The appearance was featured by The State Journal-Register on May 2, 2014.